PeopleSt in Los Angeles is one example of residents using tactical urbanism to reclaim public space and make their streets more human-centered. Photo by LA DOT/Flickr. For all the buzz that tactical urbanism has received in the past several years, there’s still a lack of public consensus about the movement’s exact meaning, impact, and potential for change. 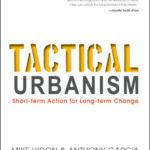 Mike Lydon and Anthony Garcia, Principals of Street Plans Collaborative, take on these questions in their comprehensive guide Tactical Urbanism: Short Term Action for Long Term Change. Their new book explores the ways that neighborhoods, individuals, and local governments are developing short-term, low-cost, and scalable projects to bypass inflexible planning and create change in their communities. TheCityFix sat down with Mike Lydon to discuss how tactical urbanism is giving cities the tools they need to become more equitable, responsive, and vibrant places. What would you say is the most common misperception of tactical urbanism? It’s a term that’s often applied to a wide range of creative interventions—like public art. While those are great, the common thread of tactical urbanism is that there’s intent for long-term change and transformation. It can get lumped in with other activities in public space. A second misperception would be that it’s another quick solution to a pressing problem. That’s not always the case—it’s not always going to solve some really massive-scale challenges to society. It’s good in certain contexts and not great in others. Tactical urbanism is all about using short-term actions to create immediate change. How can city leaders build on this approach to ensure more long-term impact? It has to be part of a process. The key is that tactical urbanism allows for more iterations of a process or project. That’s helpful, because it can take a long time for resources and political will to align in larger projects. Sometimes a project is proposed and people get excited about it, but something will happen on the political or economic side to stall larger changes. Tactical urbanism can be used during the interim phases as a placeholder to try out new approaches. How can city and local governments, not just citizens, use tactical urbanism? There are ways for governments to use, enable, and support tactical urbanism. On one hand, city governments can be on the proactive end, creating programs that are accessible and allow for citizens, organizations, and small business owners to take a leadership role in making change. Secondly, the city can be positive in its reaction to unsanctioned projects that emerge out of neighborhoods. These projects often have a very strong civic intent and gain support from local residents. It’s on the city government to look at a project with clear eyes and decide if it’s working well in one particular location and should be scaled up across the city. The role of city leaders to assess the potential for scaling is a really important aspect of tactical urbanism on the city government side. How can tactical urbanism be used to make cities serve their citizens more equitably? It’s the city’s role to take pilot programs and projects that come from certain areas of the city, share the benefits, and bring those programs to neighborhoods where they may be desired, but where there may not be a lot of organizational or economic capacity. One example is the Neighborhood Plaza Partnership, which is a way that New York City has been able to scale a private program that started in wealthier neighborhoods. 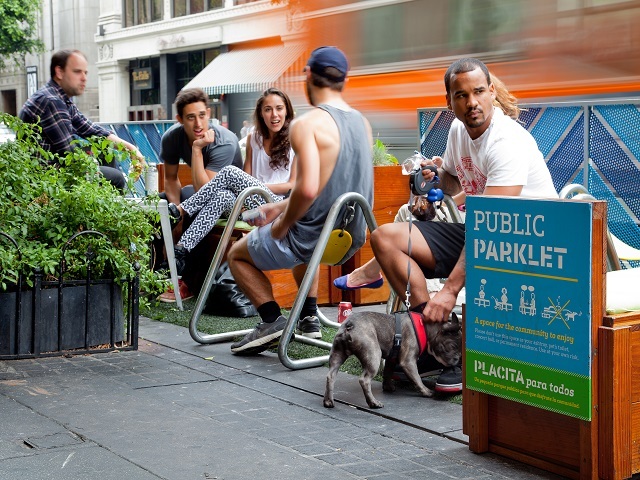 They’ve attracted private and public resources to take these plazas and help underutilized, underserved public spaces revitalize neighborhoods. It’s also important to consider access to information. This means taking tactical urbanism and making it more accessible through policies and program that meet people where they are. It’s about actively getting out of city hall and working with organizations out in the community. It’s about raising awareness among citizens that change can happen and city leaders are here to support it. A great example of this is PeopleSt in Los Angeles. What are some lessons from tactical urbanism for rapidly urbanizing metropolitan areas in China, India, and Africa? Tactical urbanism happens almost naturally in cities that are rapidly urbanizing. People often use materials that are right around them, easy to reclaim, and can be used for almost any application. In the developing world we see a lot of innovative projects seeking to create long-term change to improve neighborhood safety and access, but a lot of people wouldn’t necessarily call it tactical urbanism. Tactical urbanism has been particularly popular in Latin American cities. Why do you think that is? A lot of the political leadership and language coming out of Latin American cities over the past decade has been focused on giving resources and access to those who need it most. I think tactical urbanism is viewed as a very direct, hands-on, participatory way to do that. We’ve seen lots of interest in Urbanismo Tactico, people recognize a need, take a few limited resources, and simply try out a new approach. We worked with Ciudad Emergente—an NGO based in Santiago, Chile—to translate our guide. It’s fascinating to see the variations of projects that have emerged out of that context. What is one of your favorite examples of tactical urbanism? Ciudad Emergente has a project called Okuplaza. It was an appropriately scaled plaza project that used inexpensive materials to demonstrate to the public that an underutilized parking lot could be transformed into public space. There was a strong emphasis on recycling and educating citizens on the economic and environmental reasons for recycling through an interactive public installation.